I'm so excited to announce that I am one of the authors contributing to this collection of short stories and gorgeous photographs featuring children with cancer and their dreams. TRUE HEROES releases on September 8th from Shadow Mountain Publishing and you can pre-order it here. Twenty-one imaginative authors were paired up with twenty-one extraordinary kids. What makes these kids so special? They all have two things in common: They all have very big hopes and dreams, and they all have battled cancer. Photographer Jonathan Diaz asked each of these remarkable children, “If you could be anything, what would you be?” Their answers were the inspiration for this one-of-a-kind book. So turn the page and meet Korbyn the firefighter, Bre the dancer, Braelyn the superhero, William the dragon rider, Tristan the football star, and Rae the princess—and more—who were all photographed in full costume and digitally inserted into a background showing them as the hero of their own story. Then read the original short stories that were based on each child’s specific dream. 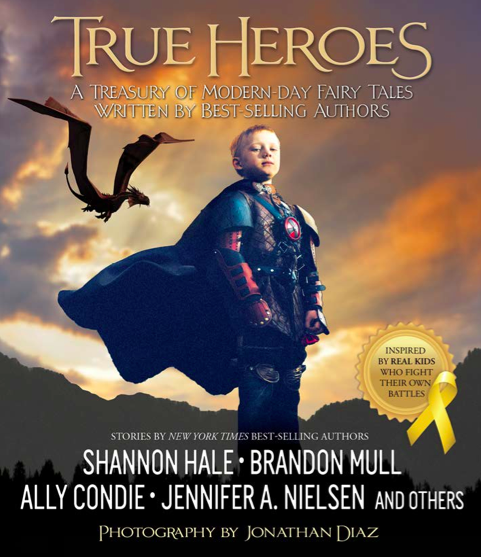 True Heroes shares the powerful message that children can do hard things. They are dreamers. They are fighters. They are heroes. We are young and unafraid.